Both salsas sound great. I do a very similar peach one. Looking forward to next weekend! Summer CSA boxes are so bountiful! We enjoy the surprises each week and then, of course, the challenge of preparing the weekly menus begins….your salsas look great! I think CSA is a great program both for the growers and those without a garden. The entire meal looks and sounds delicious but I’m a little surprised you can catch grouper in the middle of NC. Funny Larry. The grouper was not part of the CSA box but came from a local seafood shop that specializes in the freshest ocean catch. I love fruit salsas and it definitely would be hard to chose a winner. Great job Kristen and David. Looks Amazing. Bet you enjoyed seeing those sweet grandkids. I’m looking forward to my week with them. Anxious to try Kristen’s amazing culinary delights! The two salsas sound so fresh and crunchy. I’ve never made one, but always enjoy them in restaurants. There’s some trout in the freezer, so perhaps I’ll give salsa a try to go with it. Both salsa’s sound really good Penny. Thanks for the recipes. I don’t know why that corn meal dusting wouldn’t work on any fish. I’ll have to try it soon. That is summer on a plate, Penny. A good salsa can add so much flavor and zing to a meal. Can’t decide which is best? What a great problem to have, lol. 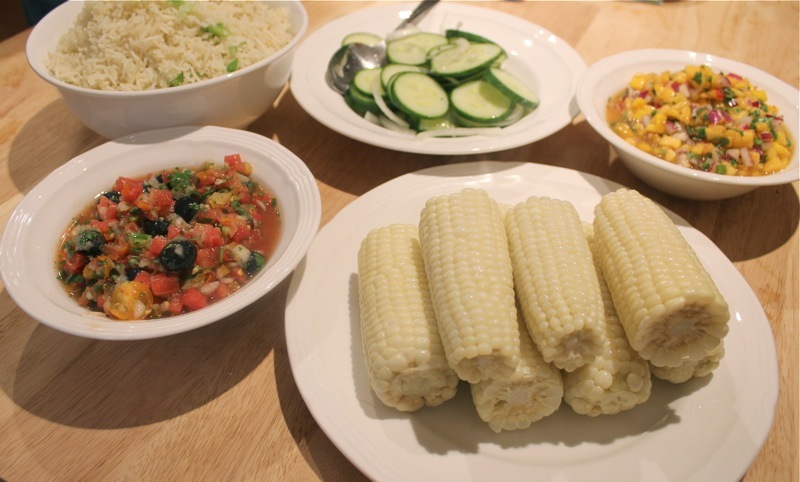 What a meal!I need to try that salsa,I have all the peach ingredients right now! Happy to see you are home and cooking up a storm again! What a wonderful program CSA is! I’m lucky enough to live close to a fantastic farmers’ market that’s open 3 days a week so get most of my veggies there in the summer. 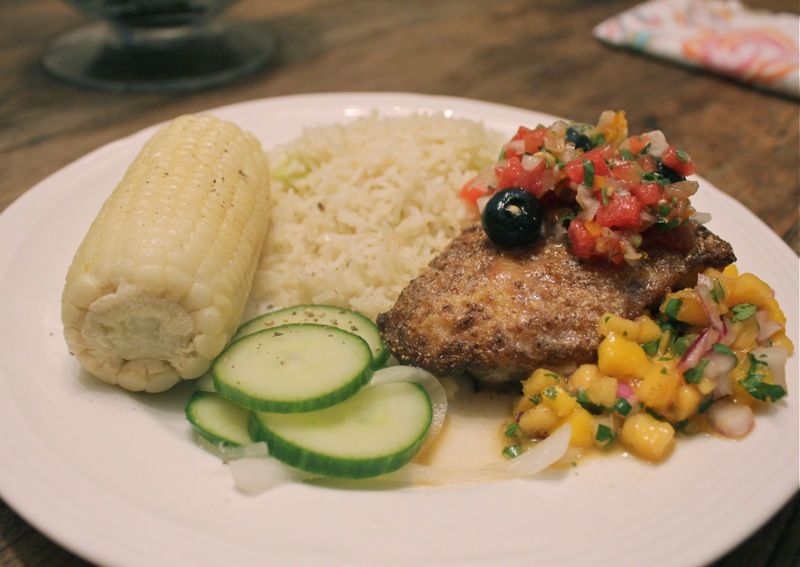 Great recipes and the grouper is making my mouth water. Yummy, that looked awesome – the flavors are wafting through the screen!!!! Glad you’re home safely – loved reading your trip highlites! It all looked wonderful. This post was published by Penny on July 19, 2013.